Title The Holy Bible, / Translated from the Latin Vulgate: / Diligently Compared with the / Hebrew, Greek, and Other Editions, in Divers Languages. / The Old Testament, / First Published by the English College at Douay, A.D. 1609. 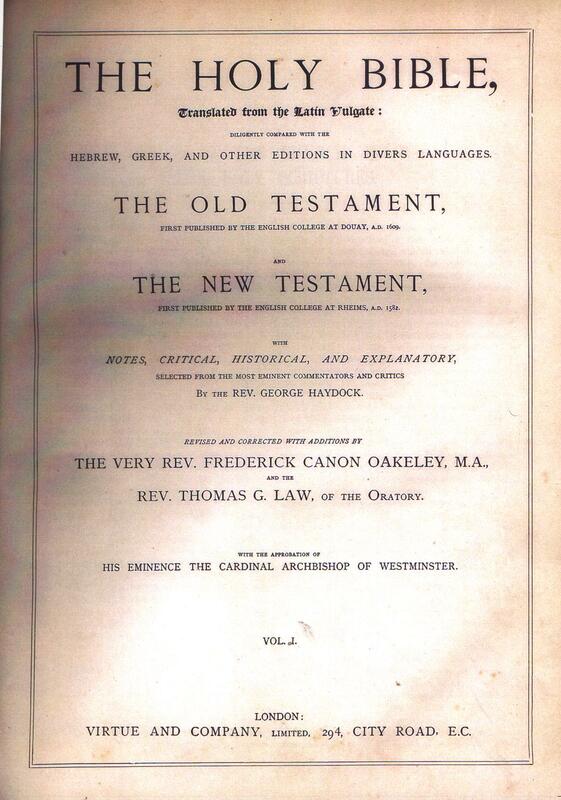 / and / The New Testament, / First Published by the English College, at Rheims, A.D. 1582. / With / Notes, Critical, Historical, and Explanatory, / Selected from the Most Eminent Commentators and Critics / By the Rev. George Haydock. / Revised and Corrected with Additions by / The Very Rev. Frederick Canon Oakeley, M.A. / and the / Rev. Thomas G. law, of the Oratory. / With the Approbation of / His Eminence the Cardinal Archbishop of Westminster. / Vol. I. [of two] / London: / Virtue and Company, Limited, 294, City Road, E.C. 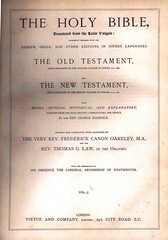 Contents The Bible in the Douay Version as revised by Challoner and MacMahon with the extended annotations of Fathers George Haydock, Benedict Rayment, and others. 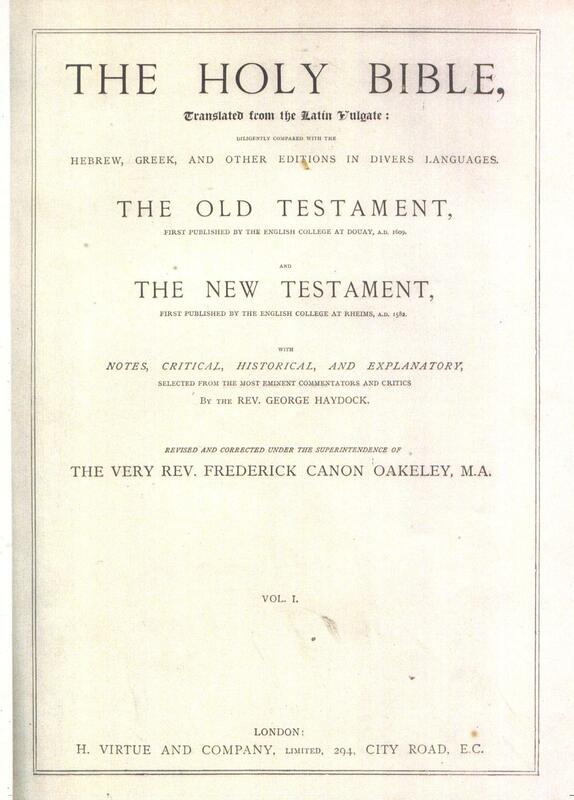 The annotations are substantially revised by Fathers Frederick Oakeley (1802-1880) and Thomas G, Law (1836-1904). Comments New discoveries in the Holy Land during the mid 19th century brought new knowledge that caused Fathers Oakely and Law to update the annotations. 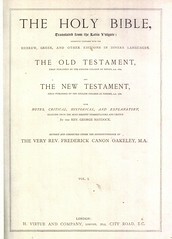 Recent Sales A copy of this edition sold for $592.76 (US Dollars) on ebay on May 21, 2012 (Ebay No. 180880092939). Title The Holy Bible, / Translated from the Latin Vulgate: / Diligently Compared with the / Hebrew, Greek, and Other Editions, in Divers Languages. / The Old Testament, / First Published by the English College at Douay, A.D. 1609. 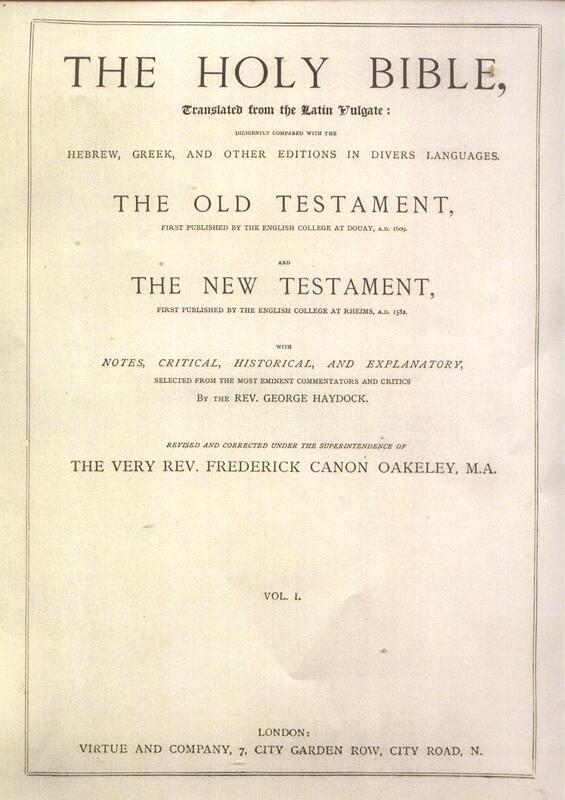 / and / The New Testament, / First Published by the English College, at Rheims, A.D. 1582. / With / Notes, Critical, Historical, and Explanatory, / Selected from the Most Eminent Commentators and Critics / By the Rev. George Haydock. / Revised and Corrected under the Superintendence of / The Very Rev. Frederick Canon Oakeley, M.A. / Vol. I. [of two] / London: / H. Virtue and Company, Limited, 294, City Road, E.C. Comments Shortly after publication, Father Law abandoned the Catholic Faith. As a result, his name was stricken from the title page on later copies. Also note the slight difference in the Virtue name on the publisher's imprint. Title The Holy Bible, / Translated from the Latin Vulgate: / Diligently Compared with the / Hebrew, Greek, and Other Editions, in Divers Languages. / The Old Testament, / First Published by the English College at Douay, A.D. 1609. / and / The New Testament, / First Published by the English College, at Rheims, A.D. 1582. / With / Notes, Critical, Historical, and Explanatory, / Selected from the Most Eminent Commentators and Critics / By the Rev. George Haydock. / Revised and Corrected under the Superintendence of / The Very Rev. Frederick Canon Oakeley, M.A. / With the Approbation of / His Eminence the Cardinal Archbishop of Westminster. / and / Imprimatur / John Card. M'Closkey, Archbishop of New York. / Vol. I. [of two] / New York: / P. F. Collier, Publisher. Comments The American appearance of this series. The publisher later founded Collier's Magazine. 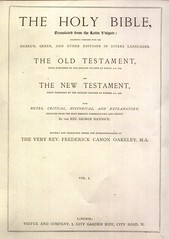 Recebt Sales A copy of this edition sold on Ebay for $800, January 9, 2012 (Ebay No. 250966227411). Another copy sold on Ebay for $405, August 30, 2012 (Ebay No. 150883763145). Title The Holy Bible, / Translated from the Latin Vulgate: / Diligently Compared with the / Hebrew, Greek, and Other Editions, in Divers Languages. / The Old Testament, / First Published by the English College at Douay, A.D. 1609. 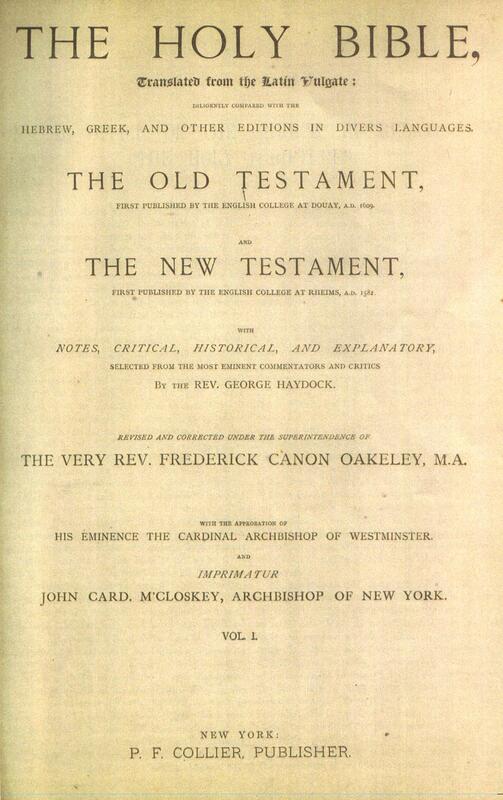 / and / The New Testament, / First Published by the English College, at Rheims, A.D. 1582. / With / Notes, Critical, Historical, and Explanatory, / Selected from the Most Eminent Commentators and Critics / By the Rev. George Haydock. / Revised and Corrected under the Superintendence of / The Very Rev. 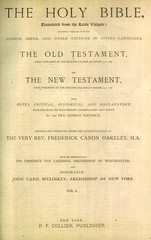 Frederick Canon Oakeley, M.A. / Vol. I. [of two] / London: / Virtue and Company, 7, City Garden Row, City Road, N.
Comments The title verso has an Imprimatur dated 1910. This is the last known edition of the Haydock Bible before modern reproductions began appearing in the 1980's. Note also, the change in name and address of the publisher.